The National Drug Law and Enforcement Agency (NDLEA) has decried allegations its operatives tortured Baba Suwe while in custody. Mitchell Ofoyeju, Head, Public Affairs of the NDLEA, in an interview with PUNCH on Thursday, October 6, 2016, said their operatives did not subject Babatunde Omidina (Baba Suwe), to physical torture during the period he was incarcerated by the agency for allegedly being in possession of hard drugs. “The NDLEA did not torture Baba Suwe. If he was tortured, he would have said it himself. This is just an unfounded rumour on the social media and it should be disregarded. Ofoyeju also revealed that the NDLEA cannot pay Baba Suwe the N25m damages the court had ordered it to pay because the Appeal Court had directed it not to. 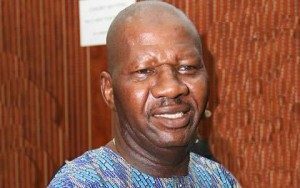 Back in 2011, Baba Suwe was arrested by the National Drug Law Enforcement Agency (NDLEA) at the Murtala Mohammed Airport on the suspicion of ingesting cocaine in his stomach. He was detained for three weeks by NDLEA. A Lagos High Court ordered NDLEA to pay the sum of N25 million for unlawfully detaining him and also tender a public apology to him.